True to form, the Long Bar actually does feature a long wooden bar where one can enjoy a drink with friends or go on a solo flight and strike up a conversation with the friendly bartender behind the counter. I don't know what the Long Bar looks like at night, but it's quite dazzling during the daytime. The huge picture windows surrounding aligning the walls lets the natural light of the sun in, and illuminates the room beautifully, giving it a fresh feel.. and yes, i'm talking about a bar. 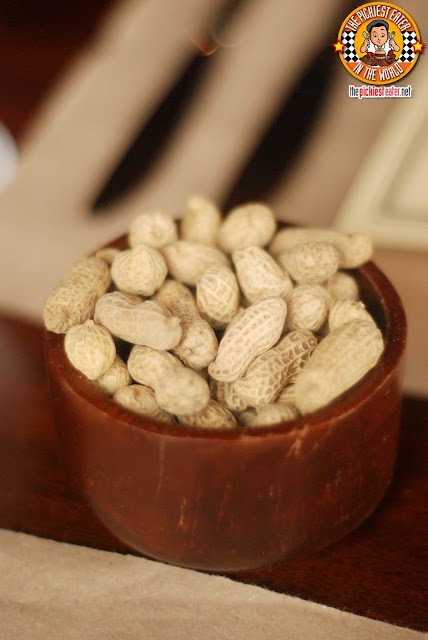 As soon as Rina and I took our seats, a bowl of peanuts was placed on our table. 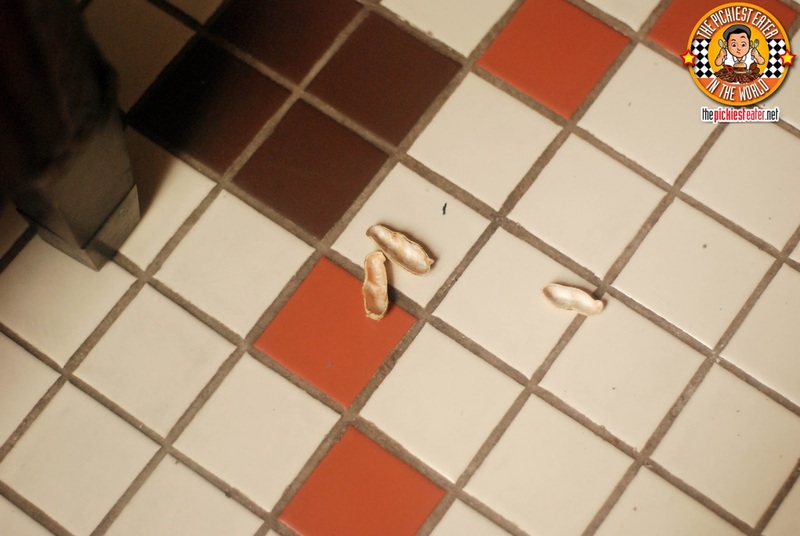 It was explained to us that during the evenings, guests that eat their peanuts are actually encouraged to just toss the peanuts shells unto the floor. 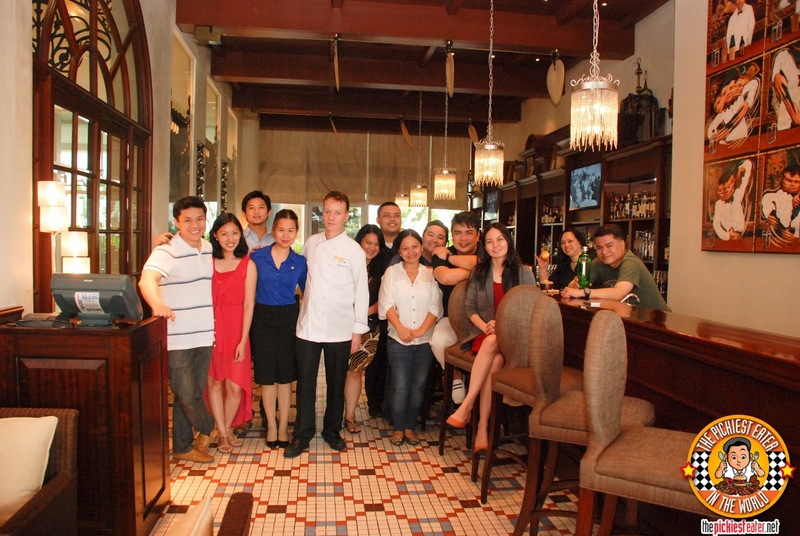 This is a long standing tradition that began at the original Long Bar at the Raffles Hotel in Singapore. This was the best that my adorable Rina - who is a stickler for cleanliness and hates making a mess - could do. I don't drink at all, but i'm constantly amazed with how some of my fellow bloggers can throw back drinks like it was Mineral water, and after numerous glasses later, look like.. well.. like they were drinking Mineral Water (I don't want to know any names but Hefty Foodie, Dude4Food, and the couple at lynne-enroute know who they are). 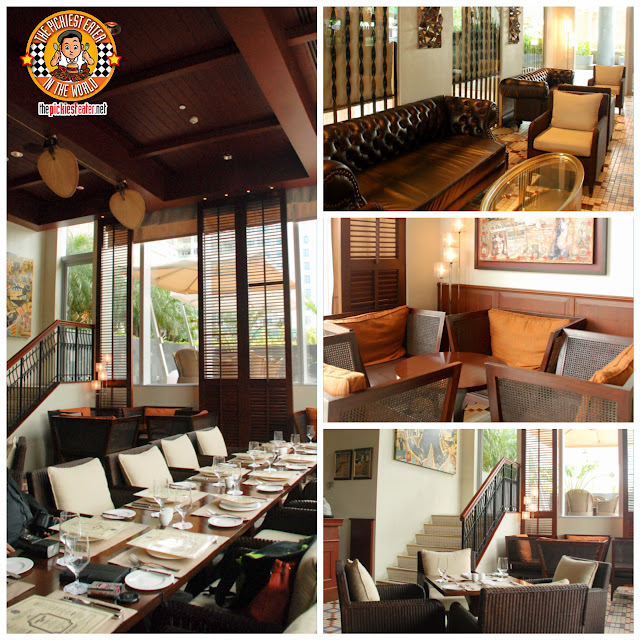 Long Bar takes pride in adhering to their Concept of "F.A.M.E. 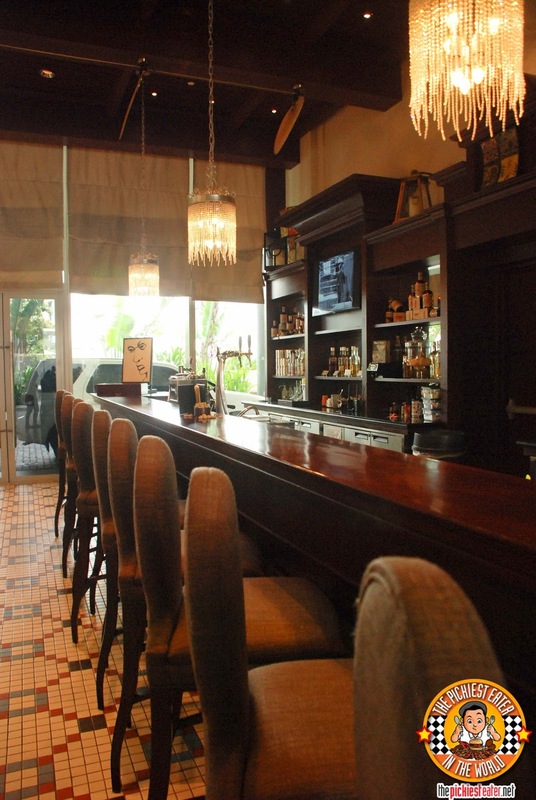 ", which stands for the "Fairmont Artistic Mixology Experience" - To Long Bar, the bar is an extension of the kitchen. this philosophy ensures that your cocktail is made with the world’s finest spirits, the freshest local ingredients, juices squeezed daily, and precisely executed by a handful of the region’s sturdiest barkeeps. Even though I didn't taste any of these cocktails, I'm sharing with you a few drinks that the Long Bar offers. TRIVIA TIME! 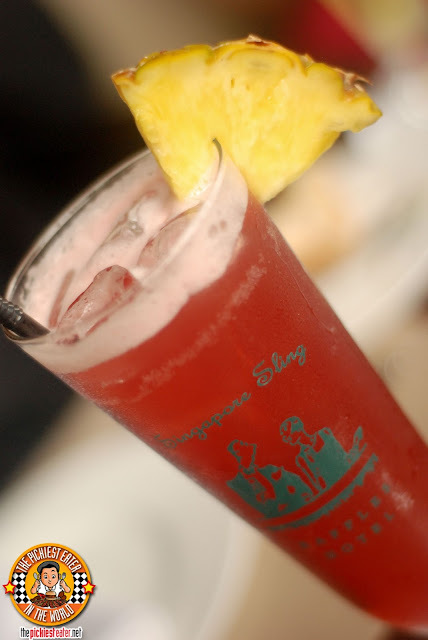 Did you know that the origin of the classic drink known as the Classic Singapore Sling (P380) can be traced to the Long Bar in Raffles Hotel Singapore? Pretty cool, huh? 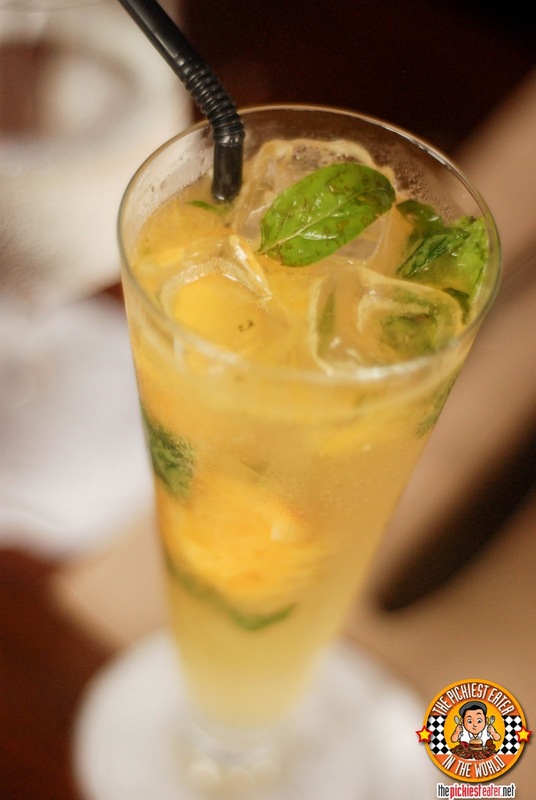 The Philippine Long Bar contingent, not to be outdone, concocted their own twist on the drink, with a cocktail called the Makati Luxury Sling. 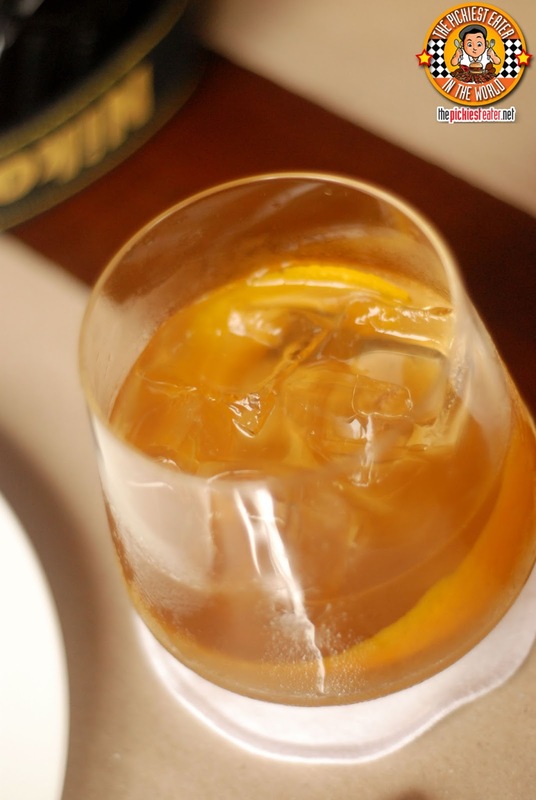 The drink's most unique feature is the 24k Gold flakes that is sprinkled over it. Like cocktails, Salads are unfamiliar territory for me. But one thing that even I had to admit, I found Long Bar's presentation their salads very impressive. 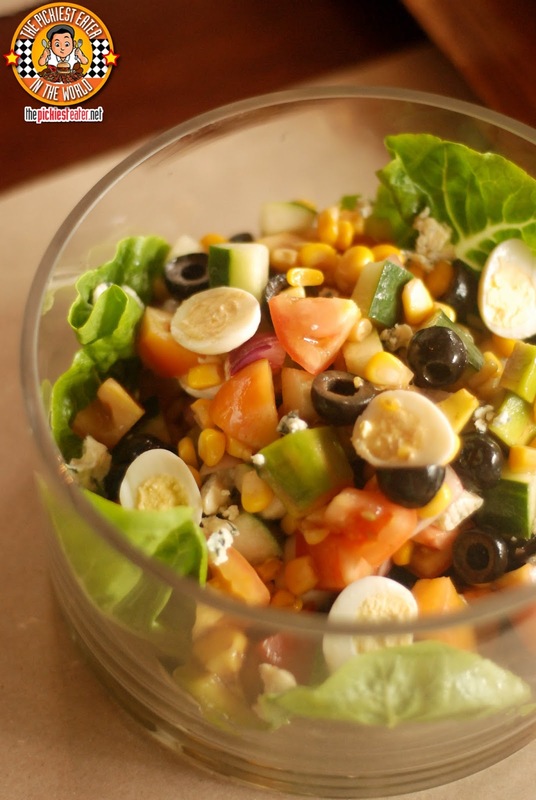 Cobb Salad (P500) consists of Lettuce, Corn, Olives, Tomato, egg, with a vinaigrette drizzled over it. 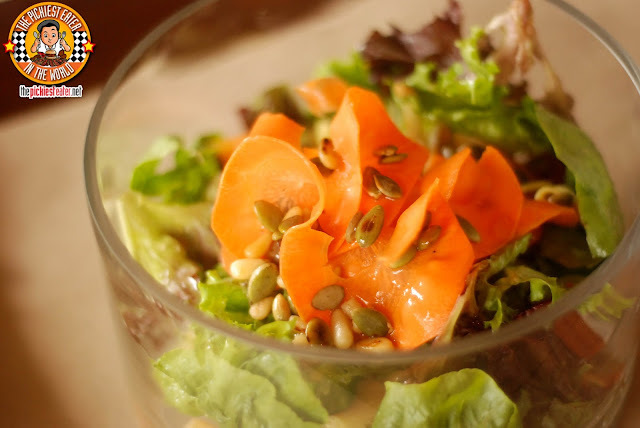 The Long Bar Salad (P700) is comprised of both Romaine lettuce and Lolo Rosso, Baby Carrots, Pumpkin Seeds, pine nuts, with a unique calamansi dressing. 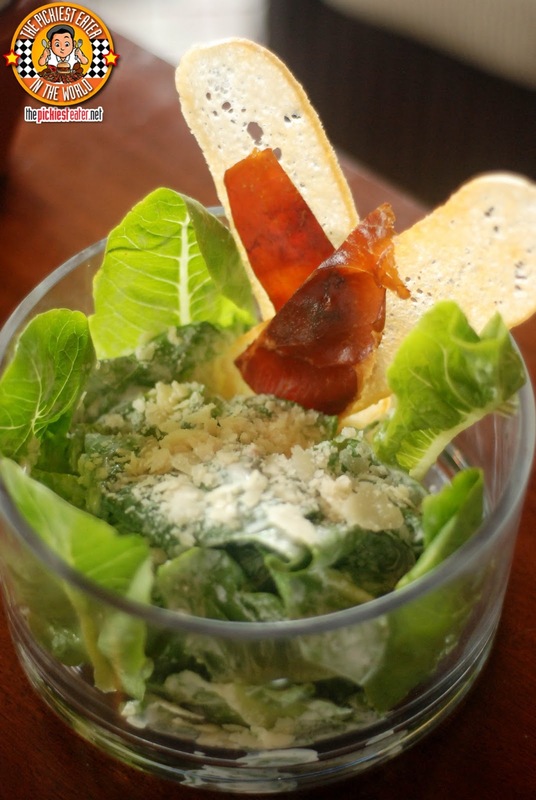 If I was made to choose a Salad to eat (at gunpoint), I would in all likelihood go for the Classic Caesar Salad (P500). It's got Parmesan cheese sprinkled over the lettuce leaves, with pieces of prosciutto for a little extra oomph. As impressive as the presentation was, I couldn't wait for the real food. 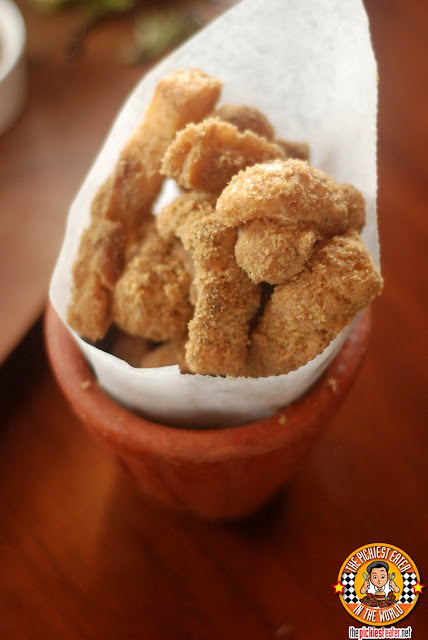 I could hear Rina's heart beat faster at the mere sight of the Long Bar's Crispy Rock Shrimp (P1,000). She's really loves shrimp, and her frustration with me is that whenever we eat out, we don't usually order anything with shrimp in it. 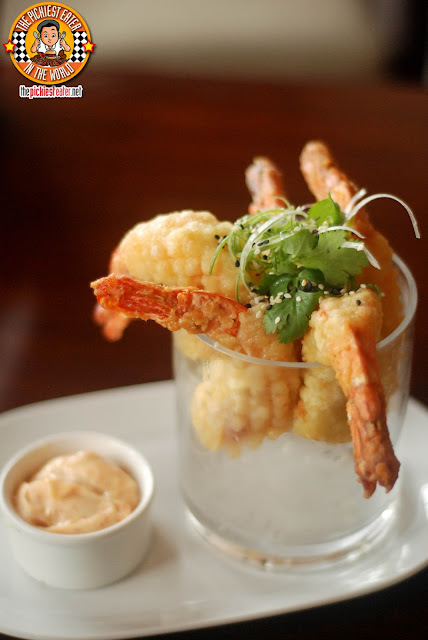 Beautifully arranged in a large glass with a side of chili mayo, the plump shrimps are coated in a light batter before dropped into the deep fryer until it achieves golden perfection. The Fried Duck Rolls (P900) were more up my alley. In fact, they were absolutely fantastic. 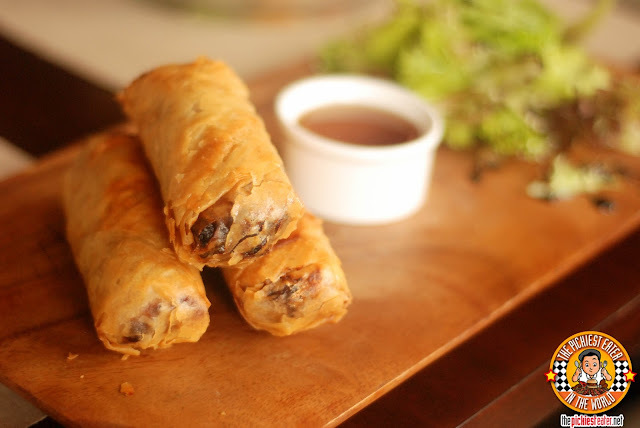 Deep fried spring rolls filled with shredded duck meat that goes perfectly with the light sweetness of the thick ginger plum sauce dip that it comes with. 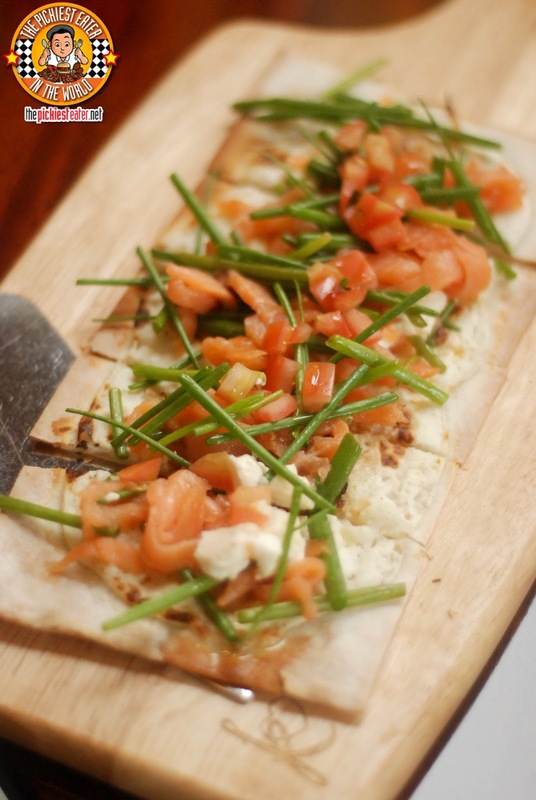 Long Bar also serves a selection of Tarte Flambee's to choose from.. 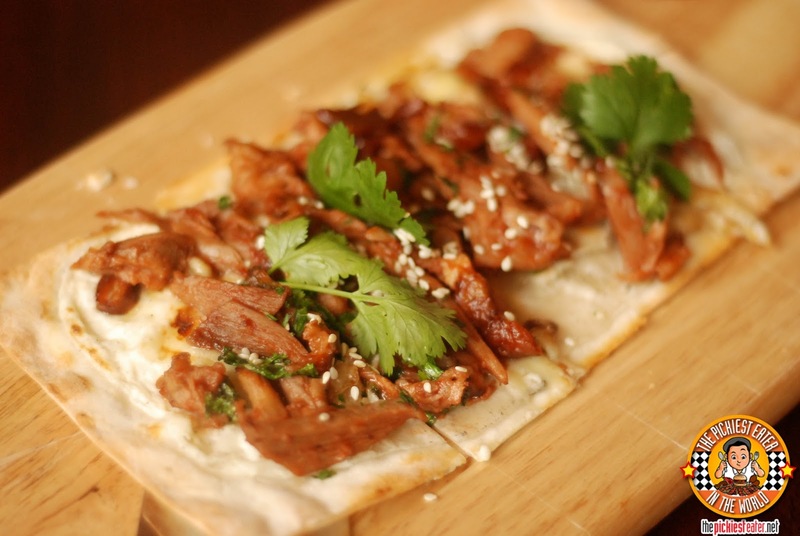 Which is more or less like a flat bread pizza. To call these glorious pieces of crackling pork merely "Chicharon" would be a travesty to everything that food stands for. These amazing deep fried pieces of pig skin is known as "Pork Rinds (P185)", is dusted in a Chili & Tamarind rub, coating the crispy pork with a stunning citrus flavor, mixed with a wonderful touch of heat. I don't know about you, but I never seem to get content with "Sliders". However, the PBB Trio (P255) of The Long Bar is a whole new level of awesomeness. 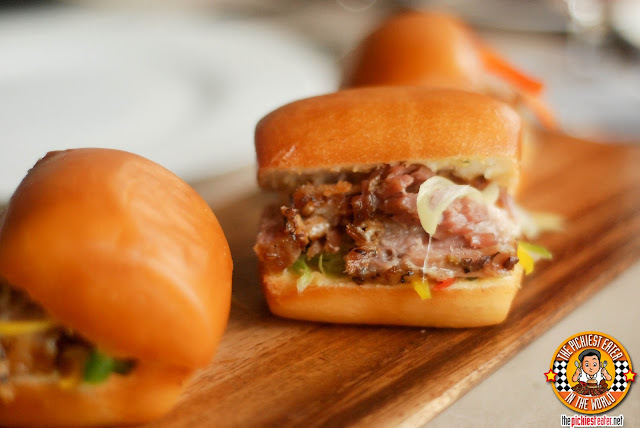 Melt in your mouth pork belly slices sandwiched between an amazing deep fried pork bun, whose outer crust features a light crisp. Placed on top of the bellies is a bit of shredded cabbage, with finished off with a smearing of mustard for and added dimension of flavor. There was something about the Majestic Ham Croque Monsieur (P700) that called out my name. 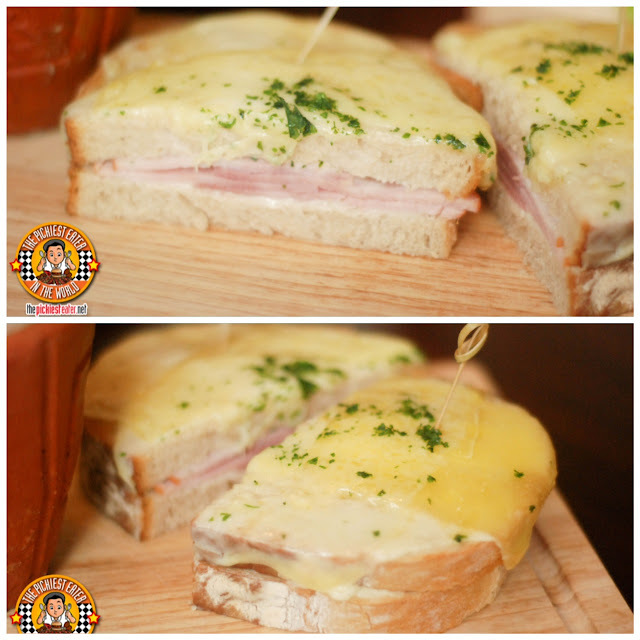 A slice of the Noche Buena staple, Majestic Ham, sandwiched between two slices of Rye Bread and topped off with Bechamel sauce and melted Gruyere Cheese. 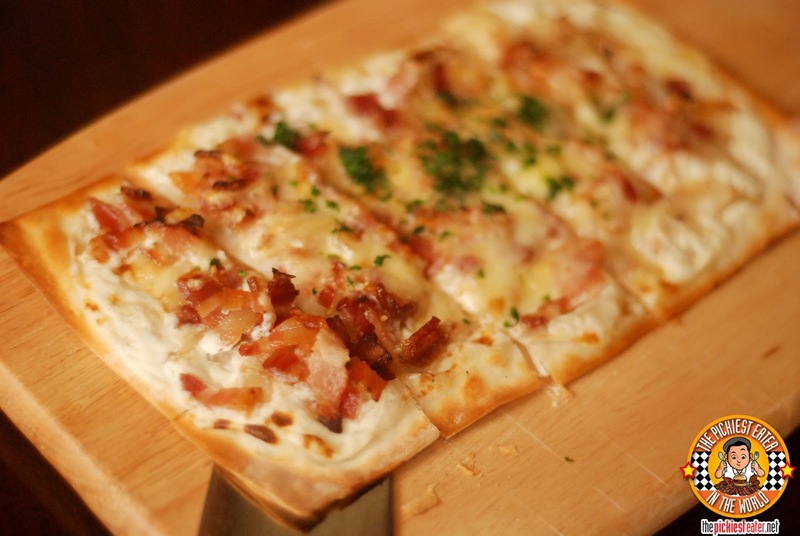 The sweet and smokiness of the ham, works perfectly with the light tartness of the bechamel and the sharpness of Gruyere. Perhaps the only thing I would change about this sandwich is the bread, as i'm not a huge fan of Rye bread. I would have preferred something like brioche or even sourdough. 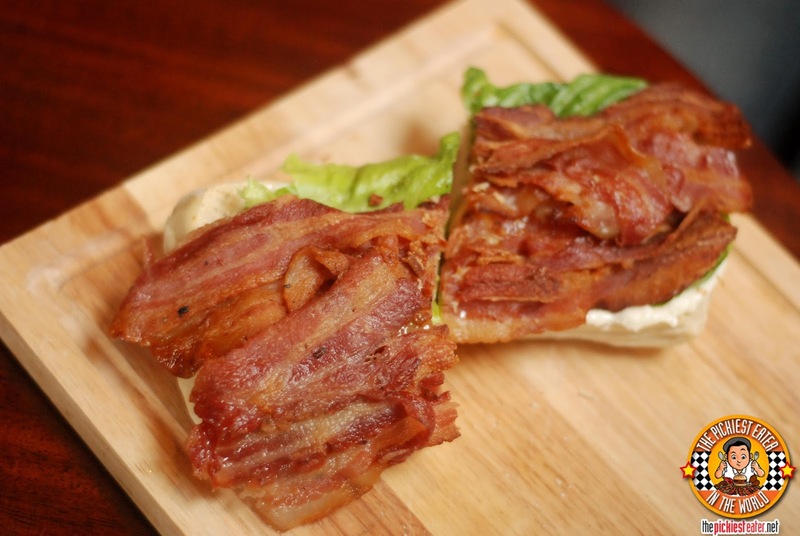 I'm sure you've all tried a Pulled Pork Sandwich, right? 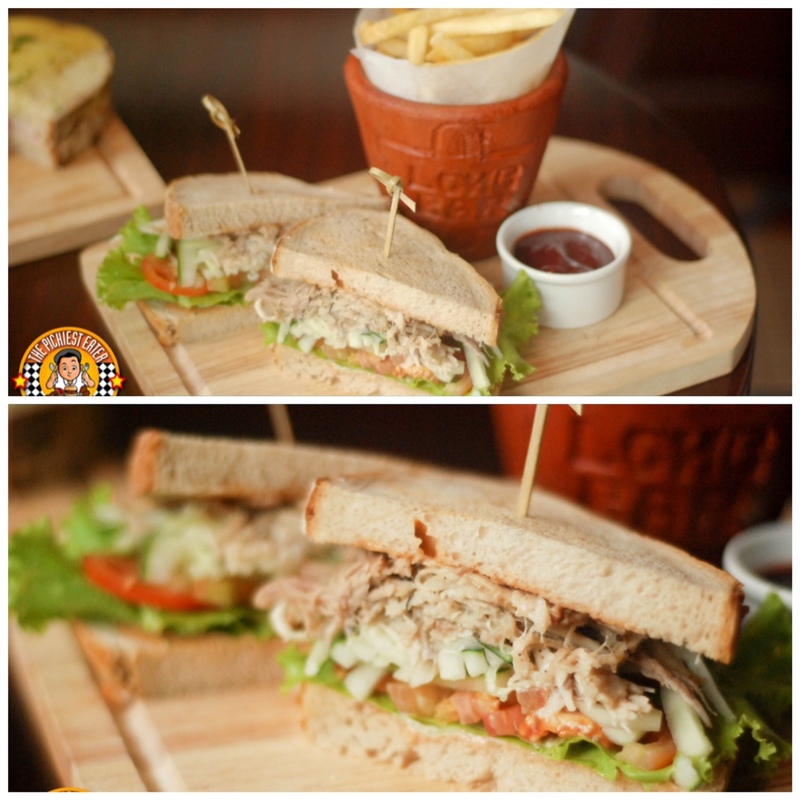 But you haven't tried anything until you've tried Long Bar's Pulled High Pork Sandwich (P600). What exactly makes it "High Pork". Truthfully, I'm not sure, but if I were to guess, it would probably have to do with the "pork" in question being LECHON. Yes you read that right. 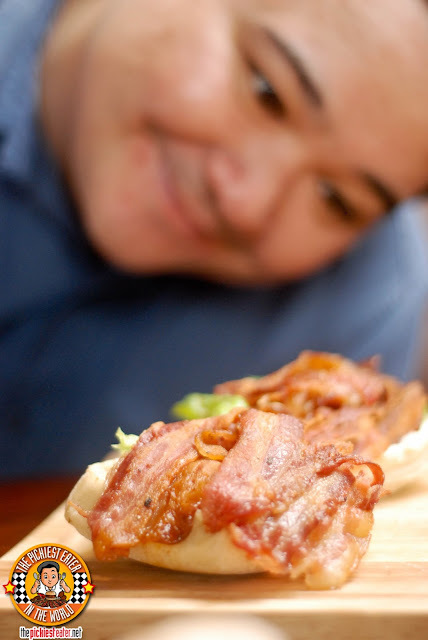 You are looking at a PULLED LECHON SANDWICH. And yes, it tastes as awesome as it sounds. One would think that I would jump at a chance to order a BLT sandwich, for as long as its on the menu, but for some strange reason I decided to try something new. 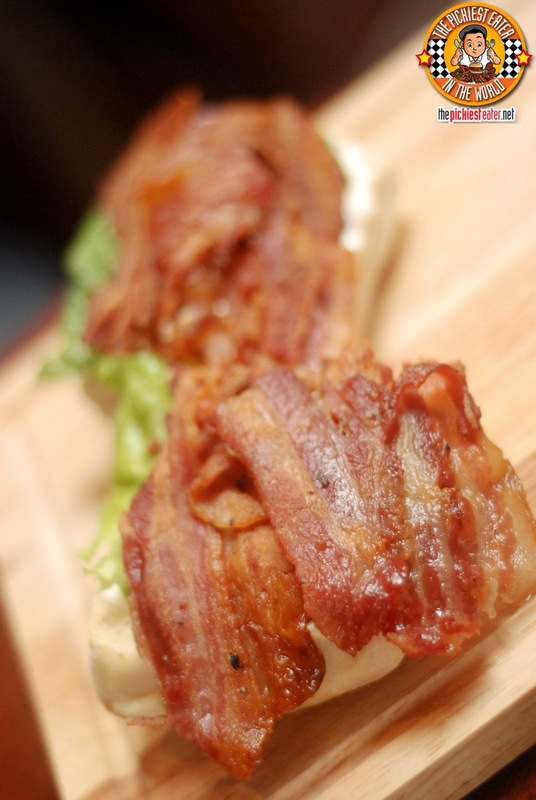 And as soon as they brought out the Long Bar BLT (P500), I knew I had made a huge mistake. Thankfully, our lovely host Loni saw the look of regret on my face and felt some compassion for my plight, and gave me some of her bacon. What can I say? It was absolutely beautiful. The bacon had a nice smokey, slightly sweet flavor, and was cooked to a wonderful crisp, and that's all I needed to know. Rina surprised me a little bit when she ordered the Lapu lapu A la Mieunere (P800). 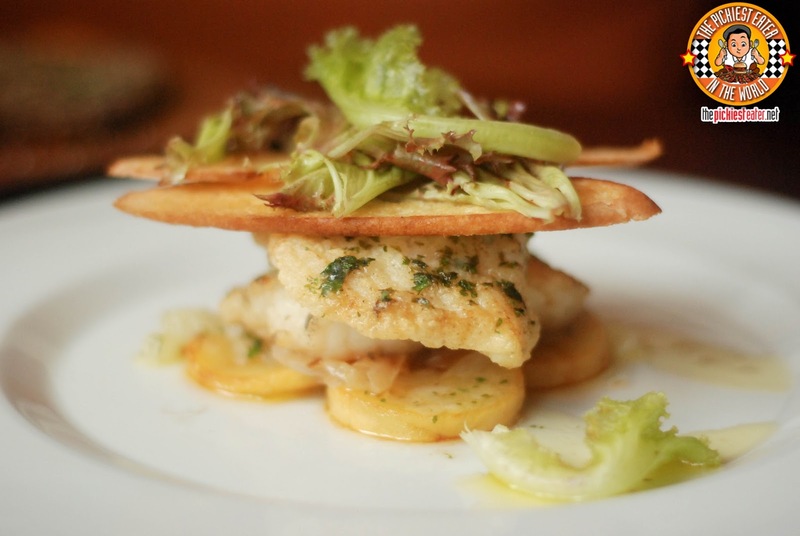 Stunning pieces of pan fried Lapu Lapu fillet, smothered in a Lemon Butter Parsley Sauce, stacked on top of a bed of Roasted Tomatoes, with crispy slices of buttered crostini and some vegetable garnish perched on top. 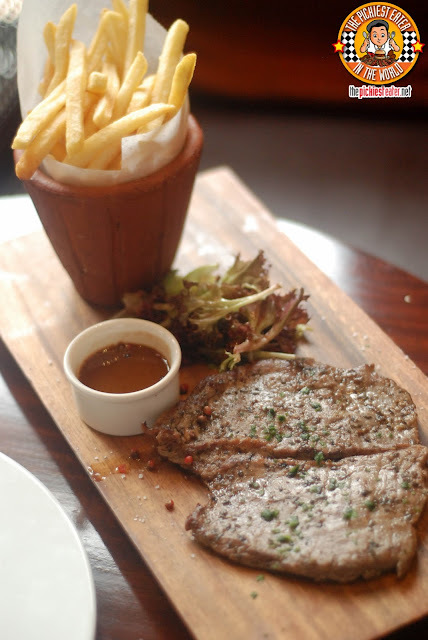 If you're looking for something heavier, then the Steak Frites (P900) should be right up your alley. It's a thin, Wagyu Flank steak with a side of mushroom pepper sauce, and french fries. 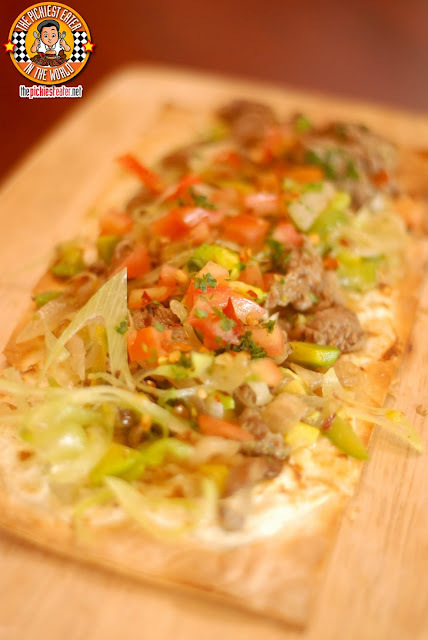 Even without the sauce, the meat is incredibly flavorful, and a closer look at the meat reveals some sort of a pepper rub that brings out the innate flavor of the beef. 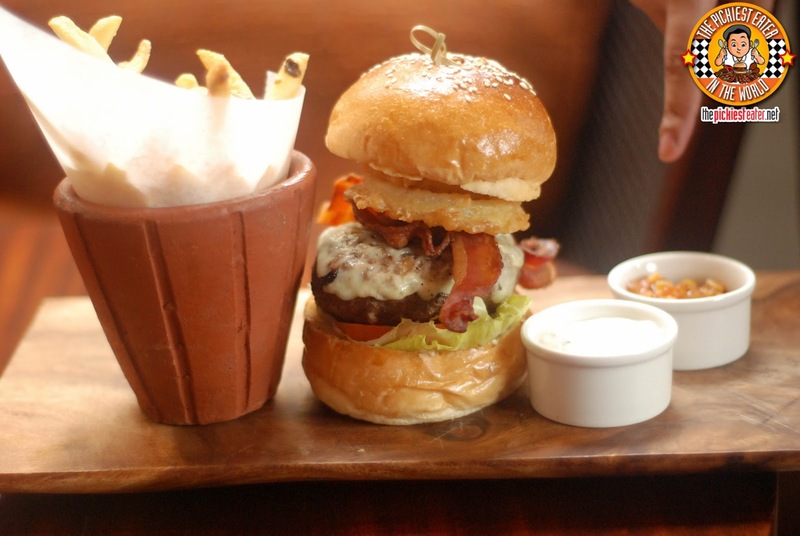 The room literally stopped when they brought in The Long Bar Burger (P600). 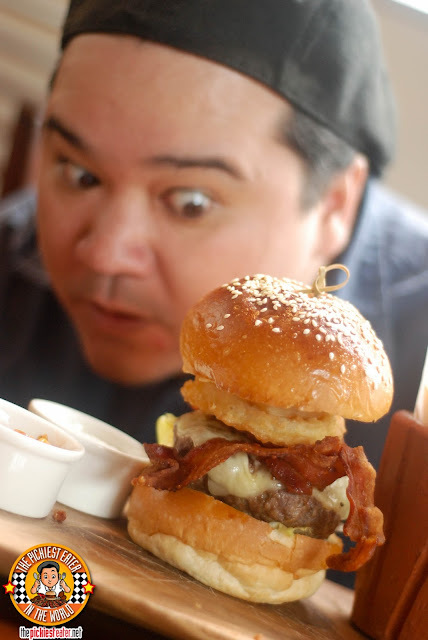 Seriously, I know its not saying much, but this burger was probably as tall as me. The thick beef patty had strips of bacon in it, a fried onion ring, and the classic fixins, such as tomato and lettuce. It also had a unique element.. Corn Relish. 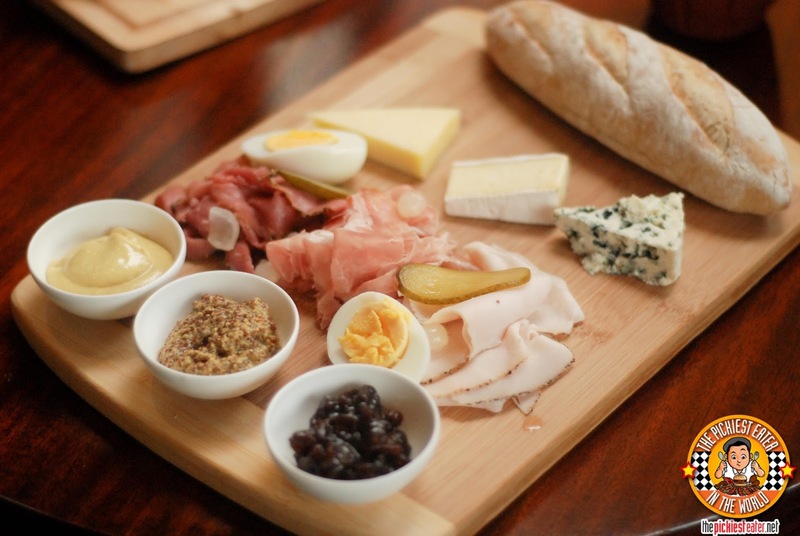 If you're looking for a European style lunch, than the Ploughman's Platter (P1,000) is what you're looking for. The platter, which is served on a wooden chopping board, is comprised of an assortment of cheeses (blue cheese, Gruyere and brie), a collection of deli meats (pork, ham, beef and turkey pastrami), served with a baked baguette, and other garnishes, such as mustard, and a hard boiled egg. The Mango and Coconut Trifle (P300) was absolutely amazing. 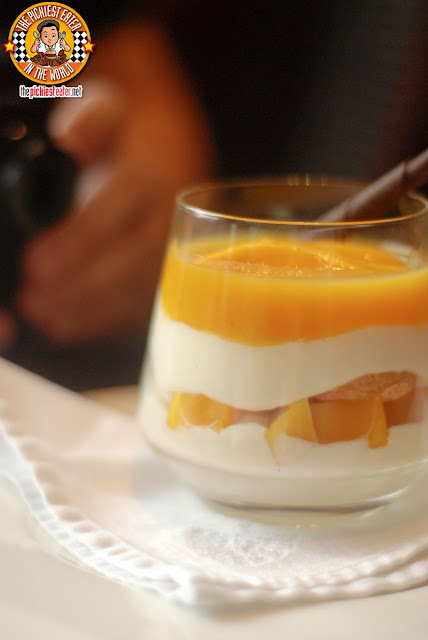 The mixture of the cream, together with the sweetness of coconut and nice acidity of the mango gave every layer a pronounced, delicious flavor. 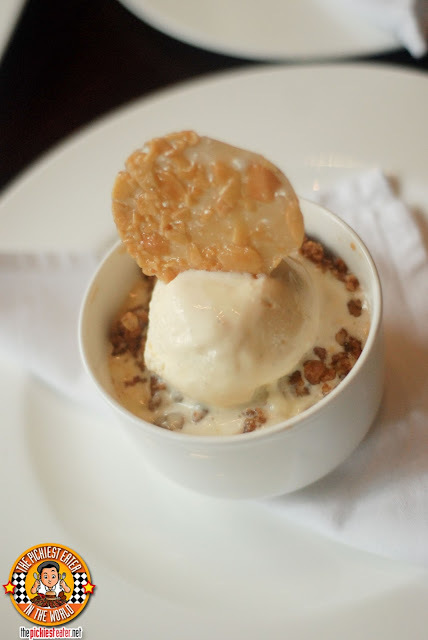 I'm a fan of any apple based dessert, and this Apple Crumble with Vanilla Ice Cream (P300) really hit the mark with me. This was a nice tartness to the apples that meshed beautifully with the buttery goodness of the crunchy "crumble" bits, with the creamy Vanilla Ice Cream bringing everything together. The Long Bar Cheesecake (P300) was an amazing sight to behold. The intricacy involved in the plating this delectable dessert was extremely impressive. 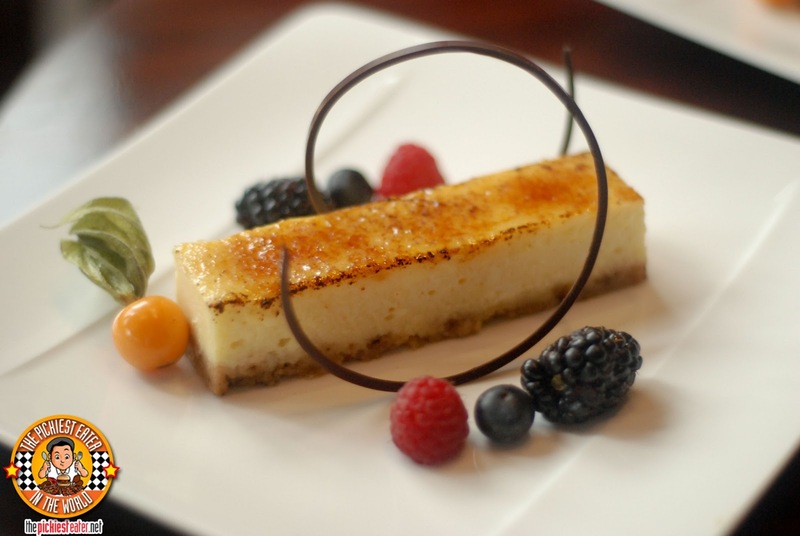 A light tartness from the cheesecake that, instead of a fruit topping of some sort, has some sort of a caramelized crust, almost as if it was "brulee-ed". Long Bar's Bread and Butter pudding with English Toffee Ice Cream (P300) was my favorite among all the desserts that was brought out to us. It was the perfect harmony of different components, coming together and making beautiful, sweet music. 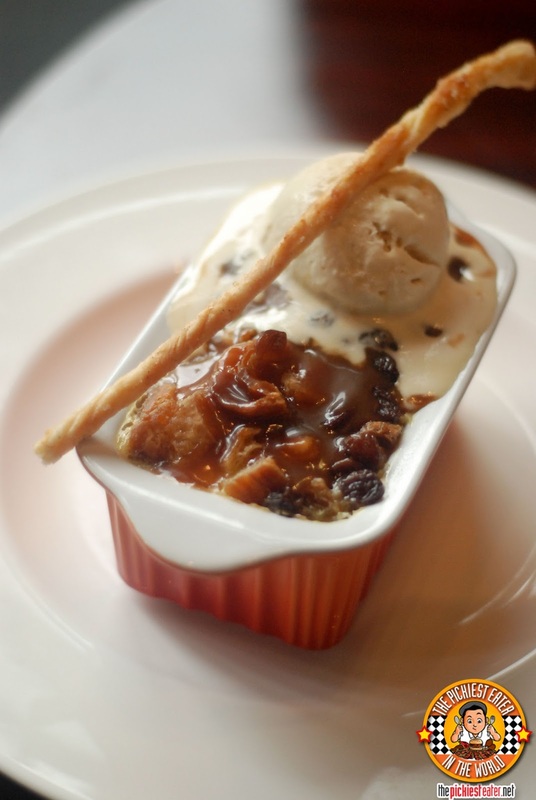 The warm, soft and buttery bread pudding, topped off with a rich Toffee ice cream that melt on top of the bread, allowing it to soak in the flavors, making for one wonderful dessert. Chef de Cuisine Gregory Georges and Executive Pastry Chef Didier Derouet really out did themselves with their phenomenal Long & Short of It, Long Bar Menu! Great work Gentlemen! I'm a huge fan! Of course we couldn't end the day without a picture at the iconic Long Bar itself. They told us to feel at home but it seems my friends Gerry and Cyrene took it one step further hehehe.. Thank you again Loni! We had an amazing time! 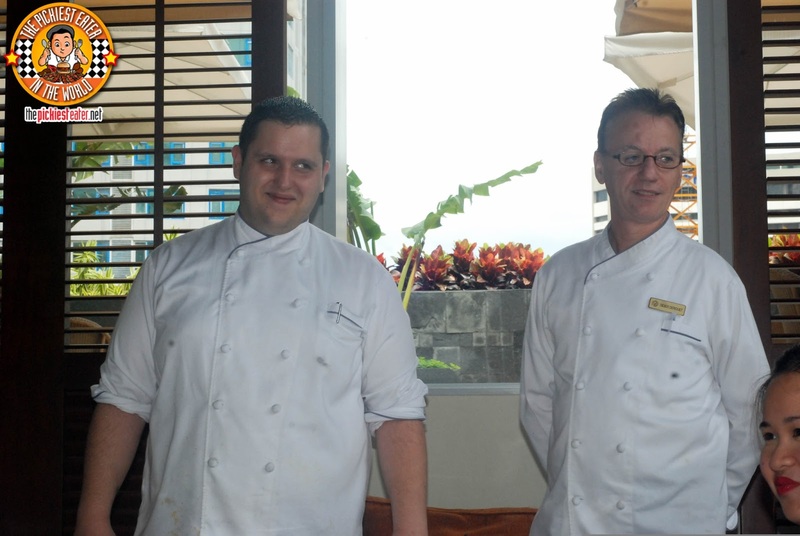 Please call our Restaurant Reservations at +63 2 555 9840 or email dining.makati@fairmont.com. Bakit nga ba? haha nonetheless, i'm sure your meal here would be memorable nonetheless!